Read the first page of Sari Warshawsky's novel imagining the world in 150 years. 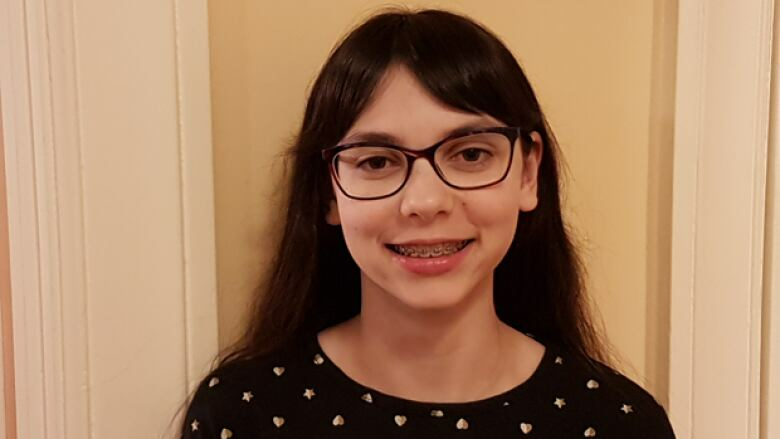 Nameless by Sari Warshawsky is the winner of CBC Books' The First Page student writing competition in the Grades 7 to 9 category. Students across Canada wrote the first page of a novel set 150 years in the future, imagining how a current-day trend or issue has played out. Over 2,400 students submitted their stories. Warshawsky, a student at Royal West Academy in Montreal, Que., tackles the pressure of perfection in her piece. My new room was perfect in every possible way. Smooth, light wood floors. Fluffy mattress with a gray duvet. Shaggy yellow carpet, perfectly centered relative to the clean, shining bright window. Huge closets full of the newest styles. It made my head spin. It also made me want to gouge the Augmented Reality contact lenses out of my eyes. But my reputation was everything. The only concrete notion in this artificial world. It would be a terrible idea to ruin it. Sighing, I crossed to my dressing table and sat down. Pulling out the small fingerprints full of moisturizing liquid, I swiped my finger over my right eye. Suddenly, half of my vision showed my perfect gray and yellow room, the other half showed a somewhat well kept chamber, with a threadbare carpet and sunken bed. I repeated this process with my left eye, then smiled. The room was just fine in my opinion, and besides, MY room should look like MY room. Not like some flashy, new-fangled interior designer's. "Child! Come down! It's almost time to leave," Parent called from down the stairs. I stomped down to them. Once again, I was shocked by how different they looked compared to his/her AR self. My parent was taller, paler and had completely different eyes. Parent pursed his/her lips "None of that attitude, Grace." I was shocked. Names had been left behind decades ago. There was no need to have separate names for everyone, the facial recognition aspect of the contacts reminded you of your past interactions with them. Addressing someone with a name was giving them a label, a gender. That was an offence. Because Parent was in our house, addressing me, the maple leaf, signifying an offence, did not disappear from his/her arm. Or maybe it did. My lenses were still upstairs on my plain wooden table. Parent fixed me with a slightly metallic stare. "Go put your contacts in at once! Do you want to shred your reputation? More importantly, are you trying to shred mine?!" "No, Parent," I answered. "I'll go put them back in." "Good. Remember, we have your appointment with the AR surgeon. I've picked out a new identity for you. They'll program that into the mainframe as well as replace your skin sensors. You had better be well-behaved this time." That tone hinted at an "or else." CBC Books asked students to give us a glimpse of the great Canadian novel of the year 2167. They wrote the first page of a book set 150 years in the future, with the protagonist facing an issue that's topical today and set the scene for how it's all playing out in a century and a half. Two winning entries — one from the Grades 7 to 9 category and one from the Grades 10 to 12 category — will be chosen by award-winning YA writer Erin Bow, author of The Scorpion Rules. The winner will be announced on CBC Radio's q on Jan. 24, 2018. CBC Books' next student writing competition is the Shakespeare Selfie Student Writing Challenge, which will open in April 2018.